LOVE. I could write an entire post on this book alone. 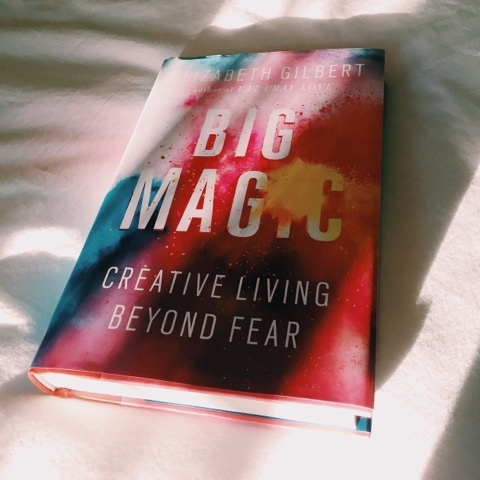 Elizabeth Gilbert (author of Eat, Pray, Love) talks about the importance of living a creative life, no matter how talented you are. I think about half of my copy is highlighted. As someone who loves to write and always has at least one DIY going on at a time, this made so much sense to me. Creating is what we're made to do. There's a great podcast called Magic Lessons where she continues to explore the topic. The one with Brene Brown was my favorite. "You are a born maker and we need what you can bring to us because you are the only one that can bring it." A great choice for an audiobook because the performance was great and there's a hilarious cast of characters. Part mystery, part real housewives drama, part comedy, this one is great when you need a break from the heavy stuff. I'm not going to lie — I definitely saw the movie first. Usually I'm a stickler for reading the book first, but I loved the story so much that I wanted to see how the author dove into it. I love how detailed it is.